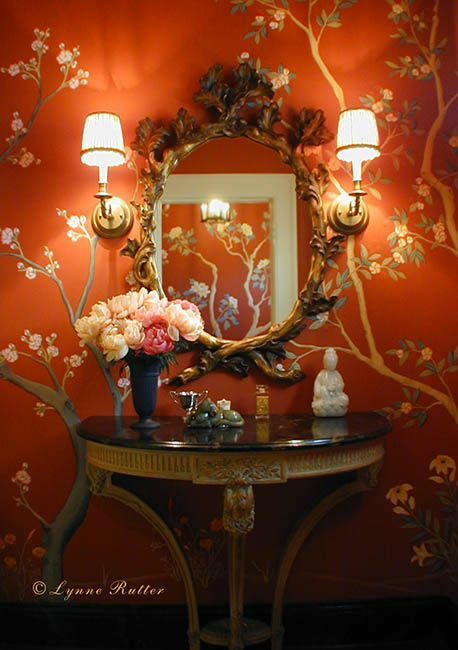 An enduring and popular decorative style since the 17th century, the flowering Chinoiserie mural is once again on-trend as a versatile component in both traditional and contemporary interior design. It is also one of my favorite styles of mural to paint! 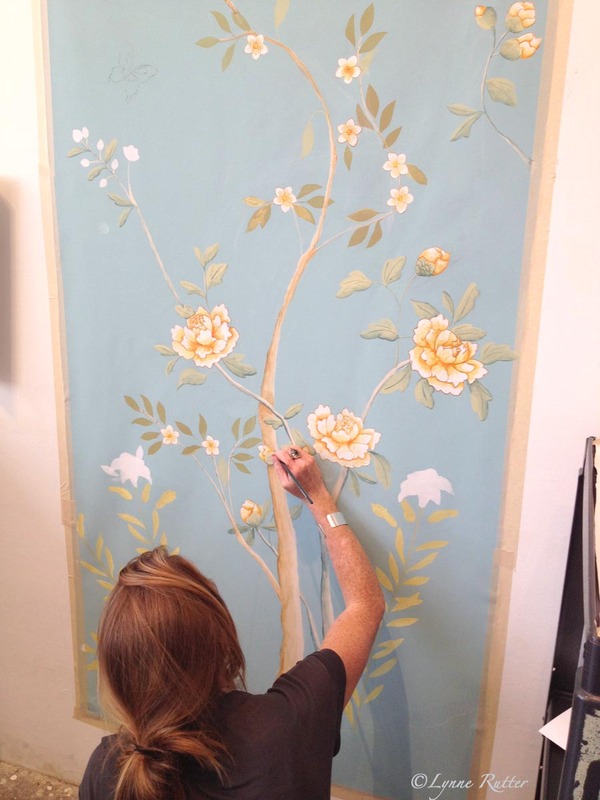 In this mural painting class, learn traditional as well as more innovative ways to paint classic Chinoiserie-style murals, inspired by the hand-painted wallpapers of the 17-18th centuries. Using various transfer methods and hand-finishing techniques, practice painting at full scale chinois flowers and plants such as peonies and plum blossoms, and learn how these techniques may be applied to any subject you wish to design into your murals: birds, lanterns, butterflies, etc. 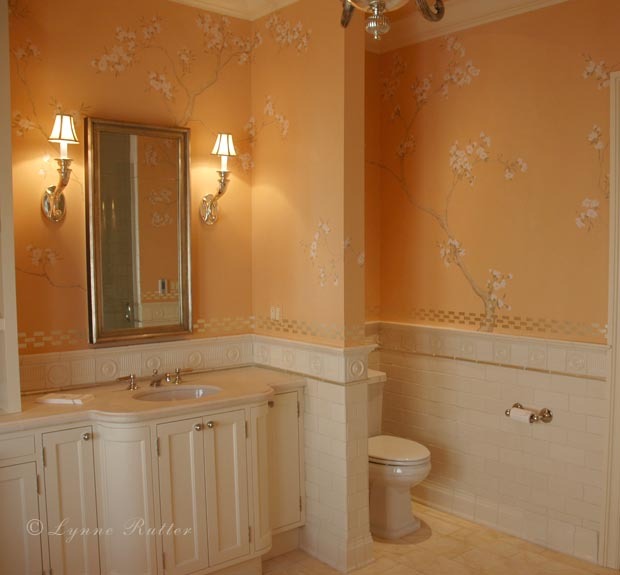 Understand how to use the elegant, confident brushwork that will enable you to create your own unique style of Chinoiserie while taking your painting work to a higher level of finesse. Practice pieces will be provided, and participants may select their own colors, composition, and details to personalize their work. Each student will create a full sized mural panel. Includes all materials and tools used in class; practice panels; a large set of reusable custom stencils and transfer drawings; full size mural panel; brushes; detailed class notes. To reserve a space in this class,you may mail a check for the reservation-deposit of $450 to Lynne Rutter at the studio address above. Please include your contact information. or contact Lynne about using Zelle, Venmo, or other payment options. Class fees will not be refundable after March 15, 2019, unless another artist can take your place. Remaining class fee of $350 will be due on or before the first day of class. Call or email the studio to inquire about this or other workshops.